Kentucky Fried Chicken tried to be healthier this year by coming out with the Kentucky Grilled Chicken. But, it seems like they were losing too much weight. 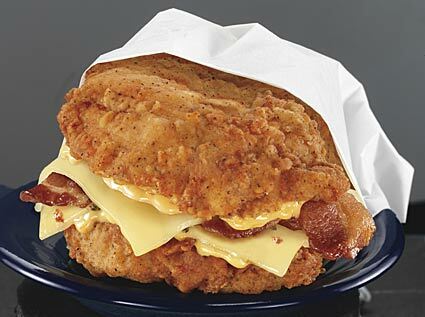 KFC has introduced the Double Down chicken sandwich in the test markets of Rhode Island and Nebraska. It is a sandwich with no bun just 2 patties of fried chicken surrounding pepper jack cheese, bacon, and the Colonel’s secret sauce. The secret sauce should be some sort of gravy making the sandwich even more gratuitous. I wonder what the Colonel would think knowing that this 600 calorie is only being sold be a meager 4.99. But, with that savings you will be able to afford the ambulance ride after sandwich number 6. Here’s to you Colonel even from the grave you have found a way to get us to eat more fried food. You are currently browsing the archives for the The Double Down category.